The European commission publishes and freely distributes the English edition of this Survival Kit written by the journalist Giovanni Carrada, whose original publication has been supported by Italy’s National Permanent Conference of Deans from the Faculties of Science and Technology. The purpose of this book is to help those who work in the world of research to communicate the contents and importance of their own work or the work in their field. In fact, it provides the essentials for public communication in science and technology for scientists who wish to take this task on in person as well as for those who choose to use the media or professionals. In this last case a scientist risks limiting his role to checking the correctness of the content and wasting precious opportunities, or worse dictating wrong choices. The idea is to take a look at what lays behind the work of professional communicators, like journalists, who understand how to address the public at large, and learn to use their skills to the benefit of science. This volume is a collection and summary of reflections and experiences from the last few years, not only in the field of public communication of science and technology, but also in the social sciences and the wider world of professional communications; in addition, naturally, to the author’s own experiences. 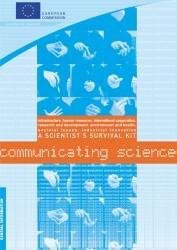 Communicating Science – A scientist’s survival kit (pdf file on ec.europa.eu, last accessed 18 Dec 2013).